Tech support with exploded view drawings, step by step repair photos and printer friendly illustrations. T.C. Electronics / Marine on-line Mercruiser and OMC stern drive repair. Yamaha, Mercury Evinrude and Johnson outboard lower unit drawings for boating enthusiasts doing service or rebuilding lower unit. Parts and tools required and a tech service number. Pistons and power head gasket sets for rebuilding your power head. 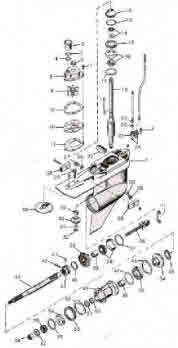 We stock parts for 1 - 6 cylinder, 2 cycle, 4 stroke outboards and most outdrives from 1971 and up. Step-by-step photo illustrations for the do it yourself or the professional mechanic. Over 500 subscribers and 1 million, 200 thousand views.